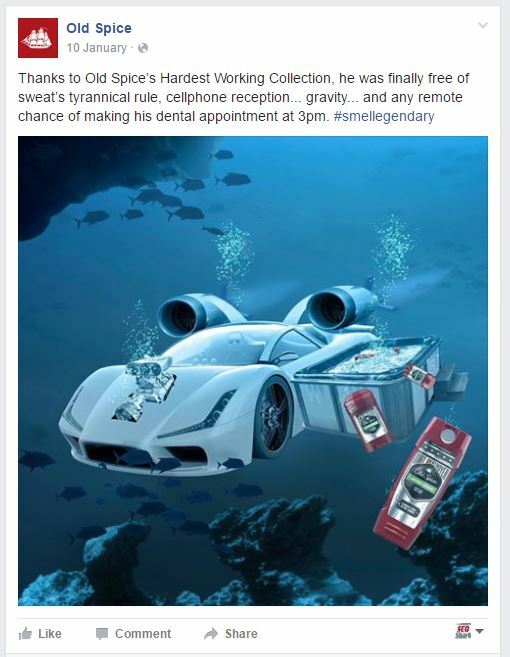 Big brands (including McDonald’s, Old Spice and Oreo) now have an increased focus on creating humorous content on their various platforms of social media for their followers. This is because humour is a great way to get readers into a happy and positive mindset, which subsequently makes them easier to convert. Big Brands are also aware that if their post is funny it is more likely to be shared, liked and commented on. Listed below are 10 real examples taken from various big brands social media accounts. These can act as a guide for you when creating humorous content for your social media pages. Many of you have probably seen the latest McDonald’s advertisements on television, most of which are now incorporating humour. The recent posts on Facebook are no different! 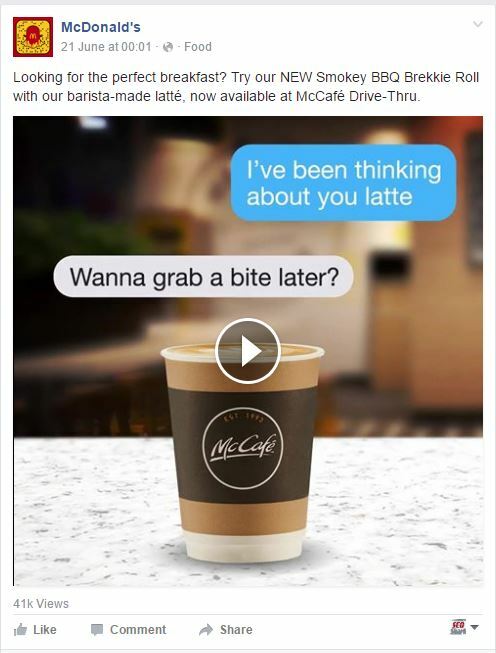 The picture below is a perfect example of how McDonald’s is using humour through the personification of a coffee and play on the word “latte” which should be “lately”. This American based company has been using humour to their advantage for a while now. 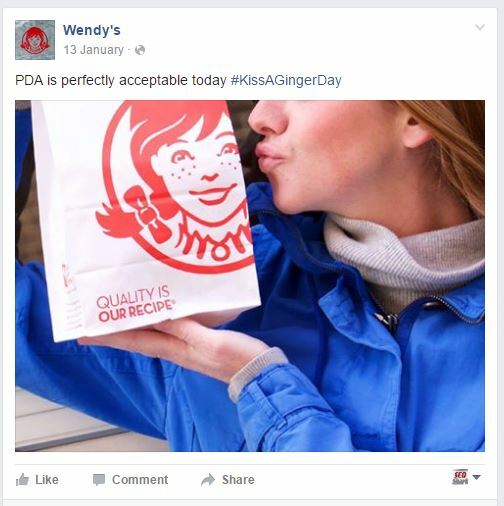 On a recent Facebook post (pictured) Wendy’s is able to successfully incorporate a relevant National Day (Kiss a Ginger Day) with humour. This is an effective example as Wendy’s is able to successfully integrate a National Day which is already trending on social media pages with humour. This has the ability to further increase the relevance of the post. 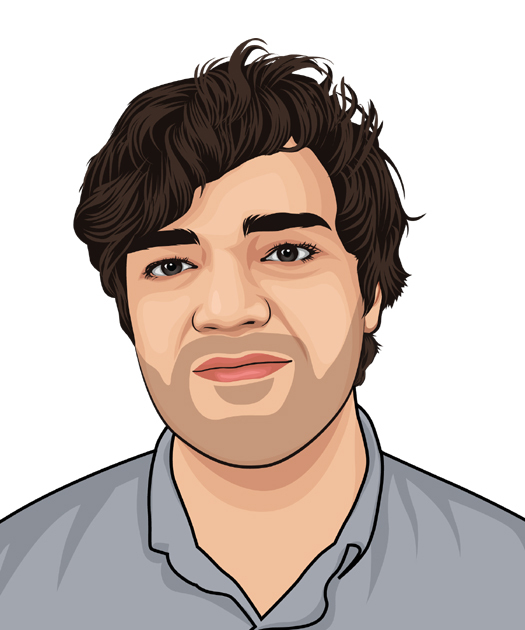 Zendesk is a Business to Business (B2B) company and it can be very difficult for these types of companies to successfully use humour as there must be a balance between humour and professionalism. 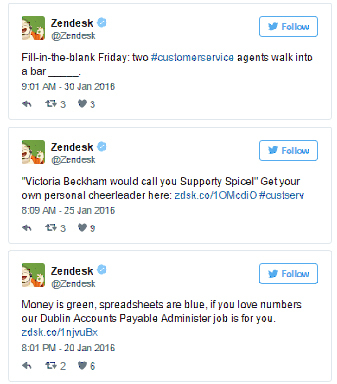 Zendesk have been able to find this balance and they use humour to promote their message which ensures they stand out from the crowd. 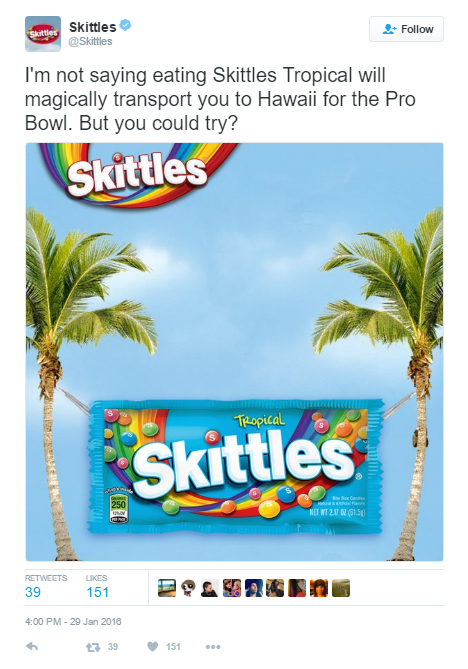 The sense of humour Skittles portrays on its social media accounts isn’t all about simply acting silly and outrageous. Skittles have been seen recently to develop a witty sense of humour. Wit and sarcasm are becoming a popular means of expressing humour as more readers are generally looking at situations from a cynical perspective. Companies that primarily offer a service, especially airlines, can find it difficult to create humour on social media accounts because they are usually spending the bulk of their time replying to consumer complaints. 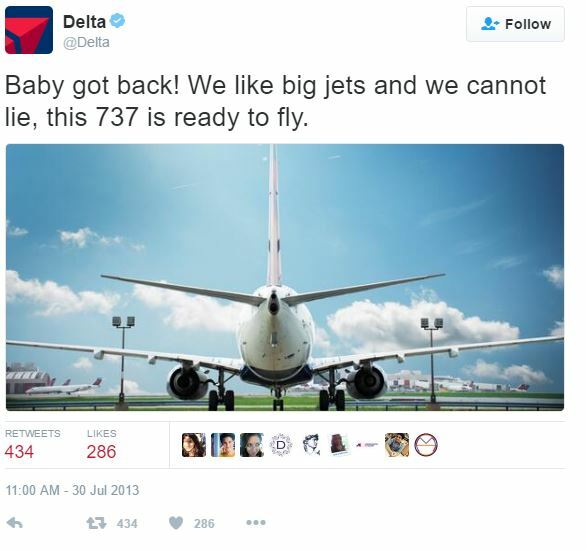 Delta Airlines has been able to create a Twitter environment which is both fun and entertaining through the successful use of humour. 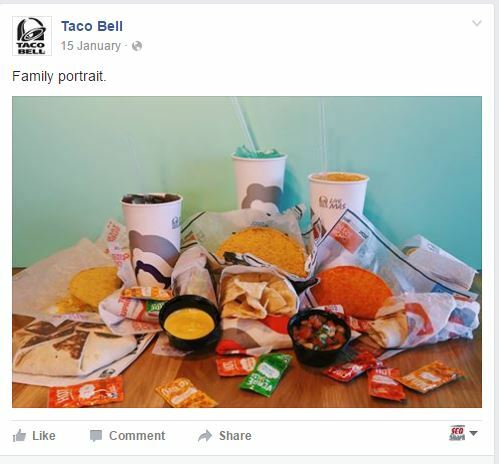 Most of Taco Bell’s social media posts contain some level of humour. This humour tactic has helped the brand to become one of the most engaging and memorable, and they now have almost 1 million followers. They are well known for their pop culture references and witty one-liners. The picture below successfully shows how Taco Bell is using pop-culture and wit to increase reader engagement. This tweet was then re-tweeted by 716 users, therefore ensuring more readers would be able to view the humour of the brand. All of the Old Spice television advertisements are incredibly engaging that they almost always go viral. The irreverent humour of their advertisements and content posted on social media has helped the brand to reach over 220,000 followers. This type of humour has also given the brand significant amounts of positive press. 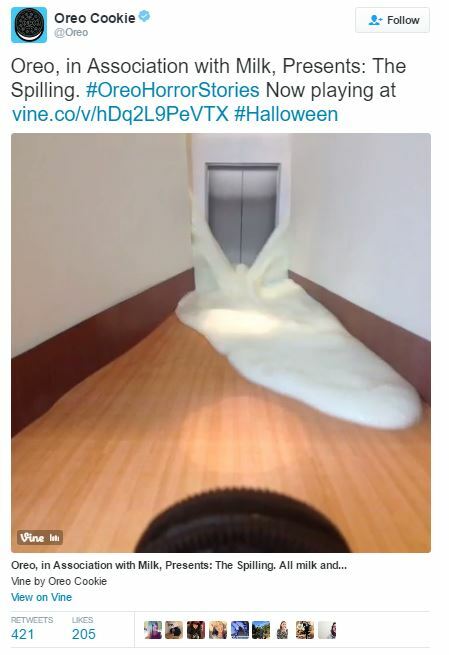 The best example of the type of humour Oreo uses can be taken from their Halloween 2013 campaign. They created a Vine video series which spoofed classic horror films (including The Shinning) which featured their cookies. Oreo is constantly producing fresh, funny and relevant content on its various social media platforms which ensures that their followers are always engaged and laughing. This American based diner has not yet reached Australian shores, but their fun, silly and slightly odd social media posts certainly have! Their posts never feel as though there was any corporate planning involved and subsequently it resonates with the younger carefree audience. Industry super fund ME Bank launched a particularly funny social media campaign for April Fool’s Day in 2016. 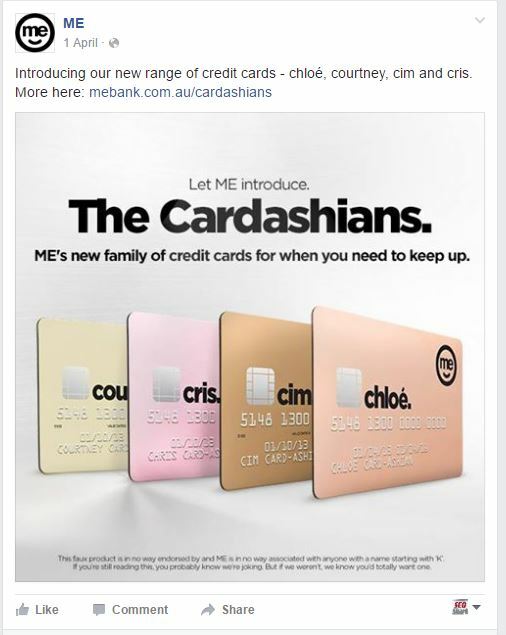 This social media campaign included the launch of a new line of credit cards called ‘The Cardashians’. These credit cards had no limit to spending and there were 4 varieties to choose from (shown below). 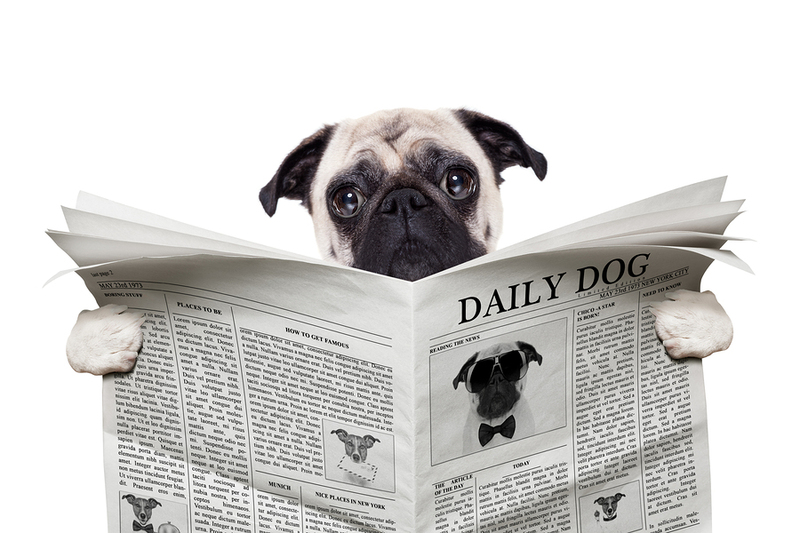 On April Fool’s Day consumers usually expected the unexpected and ME Bank certainly delivered.